Employee Awareness and Training – Getting your colleagues on board with 5S is vital, as they will be the people making it work and reaping most of the day to day benefits. Your facility should be immersed in 5S visuals and training materials. Use this attractively designed modern poster around your facility to educate and remind employees of the 5S Methodology. 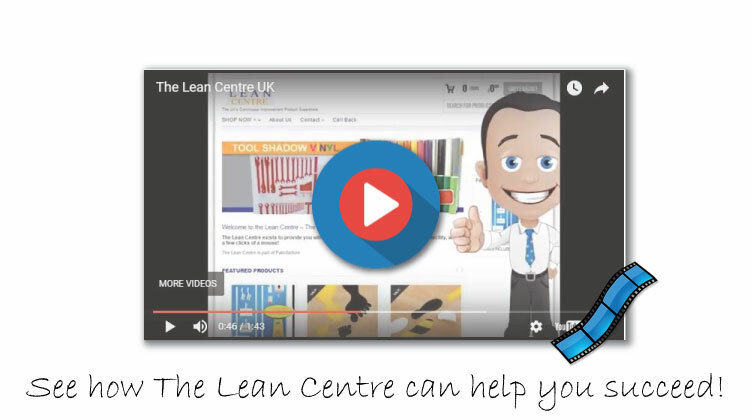 Simple and attractive modern design which is exclusive to The Lean Centre. These posters are regularly purchased by the likes of Lean Consultants, In house Lean Facilitators,6 Sigma Black belts, Kaizen Event Team Members, Managers and Teamleaders. Professionally designed 5S Posters that grab your employee’s attention and educate. These posters are regularly purchased by the likes of Lean Consultants, In house Lean Facilitators,6 Sigma Black belts, Kaizen Event Team Members, Managers and Teamleaders. Launch your company’s 5S campaign with this expertly designed self adhesive vinyl poster. Kick off your 5S awareness program with this multi coloured 5S steps visual. The artwork is designed to grab attention and educate. All of our 5S visuals are available in Premium Poster (A3 & A2), as well as self adhesive vinyl, Foamex board and heavy duty PVC banner. Vital to the successful launch of any 5S campaign, is a company wide awareness / promotional activity. The continued success of 5S within your factory or warehouse, will be due to your employee’s level of participation. Employees need to know and understand the reason behind why you are asking for their participation in your 5S initiative. By understanding the benefits behind 5S, they will see how the continued application of 5S, will benefit their work practices and environment significantly. Available in both poster (A2 & A3) sizes as well as self adhesive vinyl (also A2 & A3). Launch your company’s 5S campaign with this expertly designed poster. Available in both poster (A2 & A3) sizes as well as self adhesive vinyl (also A2 & A3). 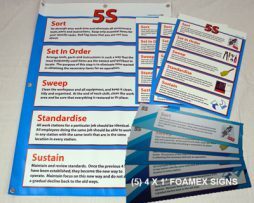 Fabufacture has created the 5S Shopfloor Series Posters to guide employees in creating organised and manageable work areas. All of the posters in this set describe and visually illustrate the 5S activity being carried out. 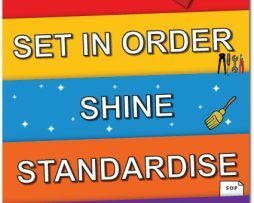 Use these colourful posters to brighten up work areas and motivate employees to practice the 5S’s every day. This set is a cost-effective and valuable way to sustain the results of a 5S program. This poster series is one of our most popular product choices and is favoured by in-house company Trainers, Lean Consultants and Lean Manufacturing Managers. Use this attractively designed poster around your facility to educate and remind employees of the 5S Methodology. Simple and attractive ribbon design which is exclusive to Fabufacture. 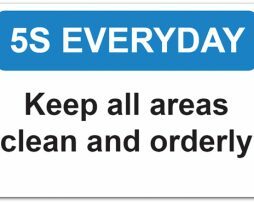 Use these signs on your Shadowboards and around your facility to help maintain housekeeping and tool control. These signs are manufactured from 3mm thick rigid foamex plastic. Theses signs are A3 landscape (420mm wide x 297mm high). 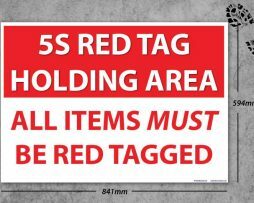 This high quality 5S Red Tag Holding Area Wall Sign (A1) is made from high quality 5mm thick Foamex. Utilising the latest thermal high definition ink, this sign is suitable for both inside and outside. 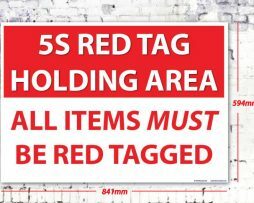 This high quality 5S Red Tag Floor Sign (A1) is made from high quality floor graphic material and 3M floor adhesive on the reverse. The largest Visual Workplace wall signs available anywhere! (A1 – 841 x 594mm) 5mm thick foam cored plastic. Promote and sustain the 8D problem solving methodology with this professionally designed visual. Available in a number of sizes and materials. 8D (Eight Disciplines of Problem Solving) is a meticulous process used to solve complex problems such as system related issues. The GOLD 5S Awareness kit is a purpose made kit that provides you with everything you need to launch your 5S campaign. 5S Awareness is a key step in launching your 5S campaign. The kit offers real value for money by providing powerful visuals that out last any training session by not only providing a constant reminder of the 5S principles, but they also provide detailed explanations of each 5S pillar. The SILVER 5S Awareness kit is a purpose made kit that provides you with everything you need to launch your 5S campaign. 5S Awareness is a key step in launching your 5S campaign. The kit offers real value for money by providing powerful visuals that out last any training session by not only providing a constant reminder of the 5S principles, but they also provide detailed explanations of each 5S pillar. The smartest landscape 5S artwork available. Launch your 5S campaign with this powerful visual. This product cleverly outlines the 5S Principle with the use of a graphical representation of each of the Esses! 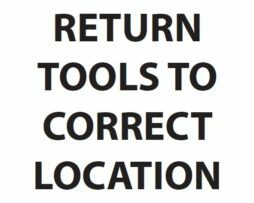 SORT – SET IN ORDER – SWEEP – STANDARDISE – SUSTAIN. Everyone has to watch where they walk, so why not put your message in their line of sight? Put your safety or 5S awareness message at employee’s feet during the critical moment of when it’s needed the most! Promote and reinforce one of the most basic and most successful work area organisational methodologies used in a working environment. The 5S Principle. No more excuses from personnel for not being made aware or having knowledge of your 5S campaign. Vital to the successful launch of any 5S campaign, is a company wide awareness / promotional activity. 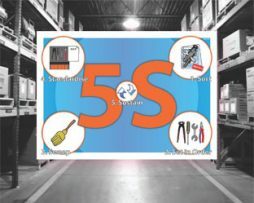 The continued success of 5S within your factory or warehouse, will be due to your employee’s level of participation. Employees need to know and understand the reason behind why you are asking for their participation in your 5S initiative. By understanding the benefits behind 5S, they will see how the continued application of 5S, will benefit their work practices and work environment significantly. The BRONZE 5S Awareness kit is a purpose made kit that provides you with everything you need to launch your 5S campaign. 5S Awareness is a key step in launching your 5S campaign. 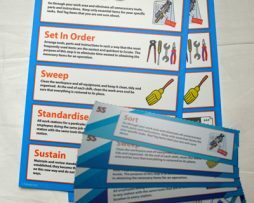 The kit offers real value for money by providing powerful visuals that out last any training session by not only providing a constant reminder of the 5S principles, but they also provide detailed explanations of each 5S pillar. Make sure your 5 S campaign gets off you the best start, by ensuring that everyone in the building knows exactly what you company stands for. 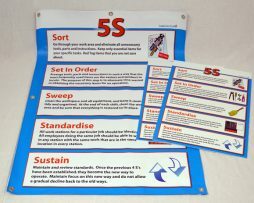 This sets of FIVE (4′ x 1′) banners not only communicate clearly the 5 S principles, but they explain / train the actions that need to be taken to achieve 5 S compliance. This package allows individual ‘S’ banners to be arranged on your chosen wall or fence / railing location, or other structure. Promote and reinforce one of the most basic and most successful work area organisational methodologies used in a working environment. The 5S Principle. No more excuses from personnel for not being made aware or having knowledge of your 5S campaign, with this 3ft x 4ft banner. 4ft x 3ft Heavy Duty PVC Banner: Vital to the successful launch of any 5S campaign, is a company wide awareness / promotional activity. The continued success of 5S within your factory or warehouse, will be due to your employee’s level of participation. Employees need to know and understand the reason behind why you are asking for their participation in your 5S initiative. By understanding the benefits behind 5S, they will see how the continued application of 5S, will benefit their work practices and work environment significantly. 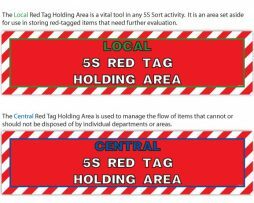 Kick off your 5S awareness program with this multi coloured 5S activities banner. The artwork is designed to grab attention and educate. Comes in heavy duty PVC banner material, measuring (4ft x 3ft). Perfect for harsh factory environments. Also comes with eyelets for hanging.